Furniture factory magnate W. Edward Showers and his wife built this handsome mansion for themselves in 1904. Features include two-story columns topped by Corinthian capitals, inlaid parquet hardwood floors, a pair of front porch sconces resembling giant ice cream cones, and a temple-like pediment. At the time it cost a whopping $10,000 and was probably the most expensive private dwelling built up to that time in Bloomington [Indiana]. For comparison, a common worker’s cottage in those days cost about $1,000, and a two-story family house might cost $3,000 or $4000. 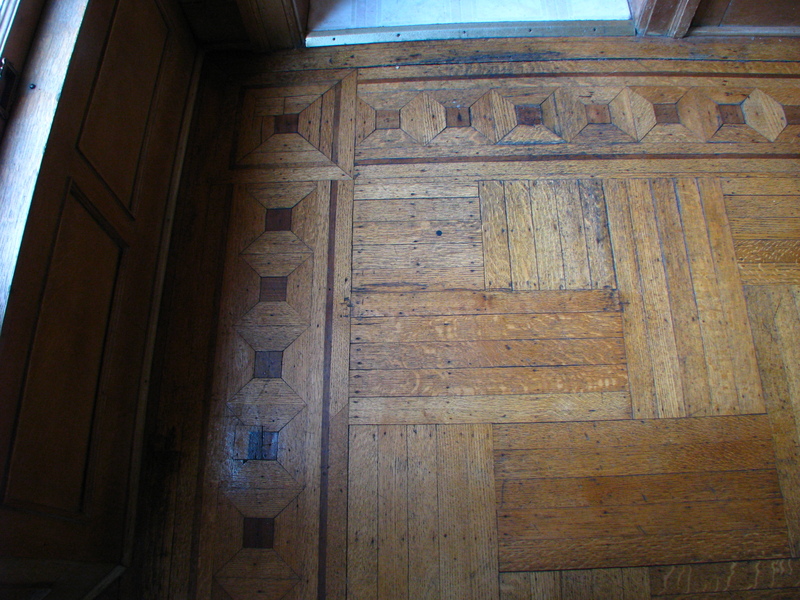 There are intricately detailed parquet floors in every room. The mansion had deep front covered porches on both the first and second floors and countless large windows with multiple lights. The house was designed by local architect John Nichols, who specialized in the style known as Free Classic, which incorporated classical elements such as columns, pediments and dentils but mingled them in a fresh way that was untrammeled by the conventions of the past. Built during the end of the Queen Anne era and the beginning of the Arts and Crafts period, the home is distinctly different from either of these styles. Note the beautiful Arts and Crafts tiles. This is the original plumbing! The building today has been rehabbed into the Showers Inn bed-and-breakfast and its thoughtful and caring owners have retained virtually all of its historic integrity. The wood-paneled front parlor is separated from the dining room behind it by towering French pocket doors and each of these rooms have elegant fireplaces with carved mantels. Because the owner of the house owned a furniture factory, hardwoods for the new house were easy to obtain, with the result that it’s filled with paneling, parquet floors, ornate moldings, a wooden coffered ceiling, and fancy doors. 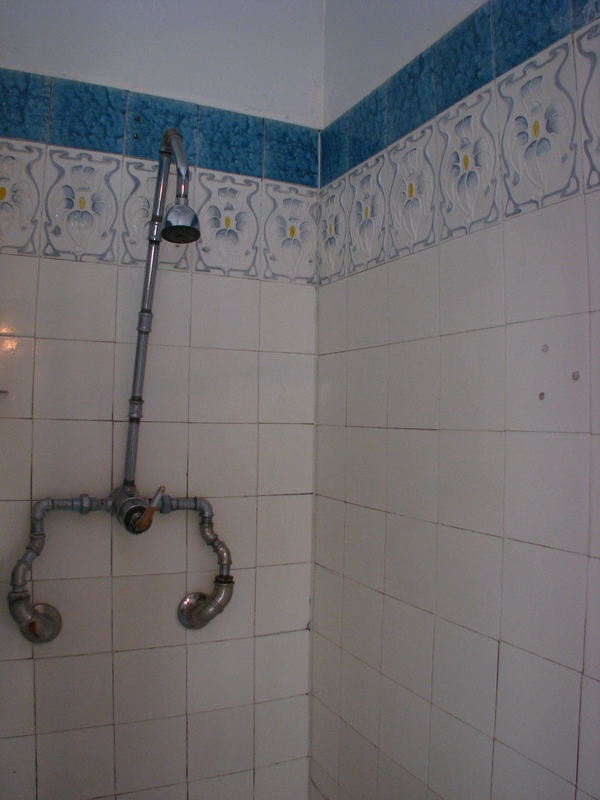 Because of the inadequacy of the city’s waterworks at the time of construction, the house had its own built-in water system. Rainwater from the roof drained from the downspouts into a massive brick-lined cistern in the basement. Water flows from beneath the circular metal boss in the side of the tub. Boilers heated the water and pumped it to the attic, where it was stored in tanks to be gravity-fed when needed. So whenever a family member or servant turned a hot-water spigot anywhere in the house, hot water gushed forth. 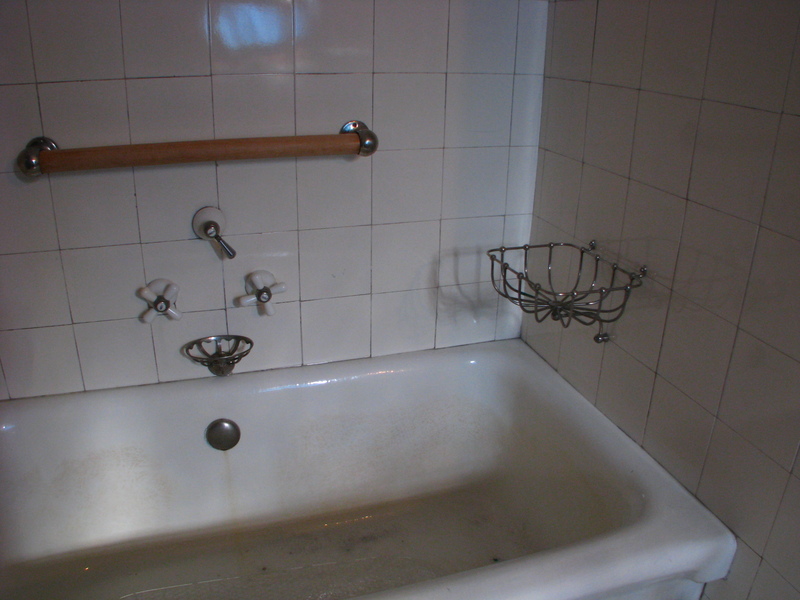 The amazing thing about the Showers mansion is that all the original sinks and bathtubs were preserved by every subsequent owner of the house. Instead of projecting faucets, the bathtubs have flat circular metal bosses set nearly flush against the porcelain tub wall, and the water would flow smoothly from beneath the boss. It’s not clear where the toilets originally flushed to, because Bloomington did not yet possess a sewer system. We can assume that they flushed into a buried vaulted cesspit. Be sure to look at the website of the Showers Inn, http://www.showersinn.com/ for virtual 360-degree tours of most of the rooms. 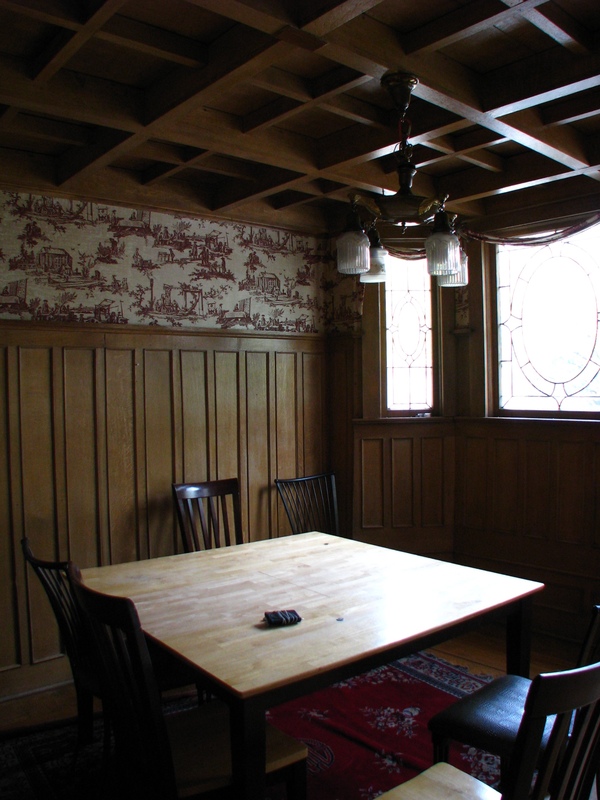 The breakfast room has a coffered ceiling.